Info "Slice the rope to drop the cage and trap the animal!" 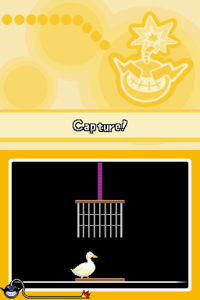 Cage Match is a microgame found in the Cute Cuts stage in WarioWare: Touched! The objective of the game is to slash the rope holding up the cage to cut it so it can trap the animal underneath. 1st level difficulty: The player must catch a duck. The duck is always in the part on which the cage falls. 2nd level difficulty: The player must catch a lion. It can get out of the part on which the cage falls. 3rd level difficulty: The player must catch a chicken. When it passes the part on which the cage falls, it walks faster. The chicken that appears in the third level is the same one that is in the Chicken Pinch microgame. This page was last edited on October 1, 2018, at 11:26.